Only three books have been published that dealt exclusively with stretch glass. The first one was Kitty and Russell Umbraco's book, Iridescent Stretch Glass, published in 1972. 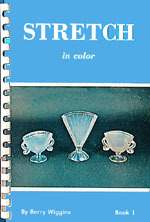 Berry Wiggins published another book, Stretch in Color, in the same year. The next book on stretch glass was published in 1998, over 25 years later! 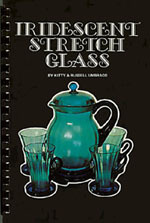 This book was by John Madeley and David Shetlar and was titled, American Iridescent Stretch Glass. These works are also described below. Book consists of 62 pages with 22 color plates. At the time of its production, little was known about the manufacturers, so don't pay too much stock in attribution of pieces. Occasionally appears in used book sales. In 1974, the Umbracos published a paper covered supplement. This is occasionally found inserted in their book. The supplement contains a listing of prices of the pieces illustrated in their book with estimates on prices for different colors. Two pages of black and white photos are also included. Several of the attributions were corrected, but many others were not. This 48 page booklet (with cardboard covers) contains 19 color plate pages and one black and white page. Most of the attributions are incorrect, but Berry printed a corrections page a few years later. This book occasionally appears in used book sales. 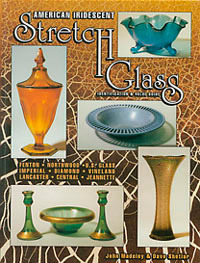 This 189 page, soft cover book was published in 1998 and is likely the most complete work on stretch glass to date. While the original goal was to illustrate every form (each mold used) of stretch glass known, there are many pieces that were not included. On this web site, many of these missing pieces are now included. The book is still available from Amazon.com even though all the stock has been sold and Collector Books does not intend to reprint the book. Some book dealers still carry used and unused copies. 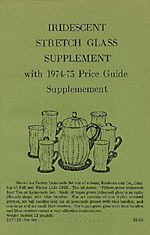 There are many books that cover the production of the various glass companies that produced stretch glass. These books can form a good foundation of an informational library. Books that we have found to be useful are listed below. Archer, Margaret and Douglas Archer. 1978. Imperial Glass. Collector Books, Paducah, KY. 226 pp. Bickenheuser, Fred. 1979. Tiffin Glassmasters. Glassmasters Publications, Grove City, OH. 104 pp. Bickenheuser, Fred. 1981. Tiffin Glassmasters, Book II. Glassmasters Publications, Grove City, OH. 160 pp. Burns, Carl O. 1996. Imperial Carnival Glass. Collector Books, Paducah, KY. 183 pp. Edwards, Bill and Mike Carwile. 2002. Standard Encyclopedia of Carnival Glass, 8th Ed. Collector Books, Paducah, KY. 496 pp. Heacock, William. 1978. Fenton Glass, the First Twenty-five Years. O-Val Advertising Corp., Marietta, OH. 144 pp. Heacock, William. 1980. Fenton Glass, the Second Twenty-five Years. O-Val Advertising Corp., Marietta, OH. 156 pp. Heacock, William, James Measell, and Berry Wiggins. 1991. Harry Northwood, the Wheeling Years 1901-1925. Antique Publications, Marietta, OH. 207 pp. Heacock, William, James Measell, and Berry Wiggins. 1993. Dugan/Diamond, the Story of Indiana, Pennsylvania Glass. Antique Publications, Marietta, OH. 204 pp. Measell, James (Ed.). 1996. Fenton Glass, the 1980s Decade. The Glass Press, Inc., dba Antique Publications, Marietta, OH. 176 pp. Measell, James and Berry Wiggins. 1998. Great American Glass of the Roaring 20s & Depression Era. The Glass Press, Inc., dba Antique Publications, Marietta, OH. 208 pp. Measell, James and Berry Wiggins. 2000. Great American Glass of the Roaring 20s & Depression Era, Book 2. The Glass Press, Inc., dba Antique Publications, Marietta, OH. 211-416 pp. National Imperial Glass Collector's Society (James Measell, Ed.). 1995. Imperial Glass Encyclopedia, Volume I, A - Cane. The Glass Press, Inc., dba Antique Publications, Marietta, OH. 226 pp. National Imperial Glass Collector's Society (James Measell, Ed.). 1997. Imperial Glass Encyclopedia, Volume II, Cape Cod - L. The Glass Press, Inc., dba Antique Publications, Marietta, OH. 227-494 pp. National Imperial Glass Collector's Society (James Measell, Ed.). 1999. Imperial Glass Encyclopedia, Volume III, M - Z. The Glass Press, Inc., dba Antique Publications, Marietta, OH. 495-762 pp. Pina, Leslie and Jerry Gallagher. 1996. Tiffin Glass, 1914-1940. Schiffer Publishing, Ltd., Atglen, PA. 191 pp. Preznick, Rose. 1965. Carnival and Iridescent Glass, Book III. Banner Printing Co., Wadsworth, OH. 70 pp. + 87 pp. plts. Ross, Richard and Wilma Ross. 1971. Imperial Glass, Imperial Jewels, Free Hand, and Pressed Glass. Wallace-Homestead Book Co., Des Moines, IA. 23 pp. Weatherman, Hazel Marie. 1974. Colored Glassware of the Depression Era 2. Weatherman Glassbooks, Ozark, MO. 401 pp. Whitmyer, Margaret and Kenn Whitmyer. 1996. Fenton Art Glass, 1907-1939. Collector Books, Paducah, KY. 320 pp. Watches equipped with UN-610 model mechanical movement, with replica rolex automatic winding function, power reserve of rolex replica about 42 hours. Watch the same table and table mirror, with the use of anti-wear sapphire crystal glass, both to replica rolex watches protect the complex movement inside, you can also appreciate the movement through the transparent bottom of replica omega the beauty of the operation, complement each other.